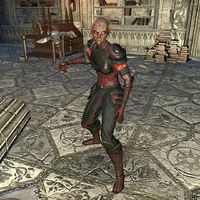 Spiderkith Fleshweavers are Spiderkith bonelords who serve as soldiers for Mephala. They use axes in combat and have the ability to summon Flesh Atronachs. A variation of Spiderkith Fleshweavers are fought in The Spiral Skein during the quest The Dreaming Cave. These versions have less health and wear light armor, and fight using staves instead of axes. The Tower Sentinels: Warn the College of Sapiarchs of the threat to the Crystal Tower. 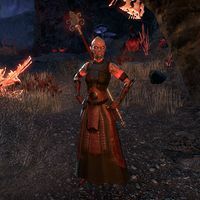 The Dreaming Cave: Find a way to communicate with Meridia and rescue her Golden Knight from Mephala's clutches. This page was last modified on 6 January 2019, at 04:32.